This has been an unusually busy Fall semester, which is why I haven’t posted anything here in several months. With classes over and all of the outstanding grading almost finished, I thought I’d take advantage of the temporary lull to post a few thoughts on some of the courses I taught this term. In this post, I’ll be talking about a third-year undergraduate course called Theory of Translation. Last year, I’d experimented with having students prepare Wikipedia articles as part of their coursework, and since the results were largely successful, I made the project mandatory this year. This time, though, students submitted their projects in three stages: 1) a 100-word proposal, in which students had to describe the topic they wanted to cover, justify why it needed a new or expanded Wikipedia article, and demonstrate that they would be able to find relevant secondary sources to draw on, 2) a draft version of their article posted to their Wikipedia user page sandbox, and 3) a final version published in Wikipedia that incorporated the feedback I’d given them on their drafts. In total, the Wikipedia project was worth 45% of the final grade (10% for the proposal, 15% for the draft, and 20% for the final version). About 20 students were enrolled in Theory of Translation this semester, which means that together, these students added about 10,000 words to Wikipedia. For the most part, the articles turned out very well. I tried to prepare students for the research and drafting process by spending time as a class thinking how to write a good Wikipedia article. Early on, we reviewed resources like WikiProject Translation Studies so we could think about what topics needed new or expanded articles. Three weeks into the course, we walked over to the university library to explore possible resources, and a week later, we took at a look at the Wikipedia article on Computer-assisted translation, which has a number of quality issues. We then spent about fifteen minutes in class trying to improve its references, structure and content: this activity doubled as a way to apply some of the readings from our unit on translation technology. These preparation sessions seem to have been worthwhile: most of the draft versions my students submitted a few weeks ago needed only fairly minor revisions to be added to Wikipedia. With only a few exceptions, all of the final articles made it into to Wikipedia. In future years, though, I will ask students to write a longer proposal so they can better assess the potential need for an article and the resources they have access to. A few students did not fully explore the feasibility of their topic during the proposal stage and then had trouble drafting an article that relied on at least three secondary sources that met Wikipedia’s verifiability and reliability criteria. This happened most frequently when students wanted to write a biographical article on a translator or Translation Studies researcher. If the person was not very well known to the general public, students could usually rely on only primary sources such as a CV or personal website for the biographical details, and these are not considered reliable by Wikipedia standards. (Incidentally, this was the most common reason that articles my students had prepared were rejected by Wikipedia editors, although in one case my student had prepared an excellent biography relying only on secondary sources, but the translator was still deemed “not notable enough” to merit a Wikipedia page). I’d like to help students avoid these problems in the future. In my last blog post, I described The Twitter Race, the game my Introduction to Translation into English students most enjoyed playing last semester, and I promised to follow-up with a post about the game my students enjoyed the least: Wikipedia Level Up. Since I’m presenting a paper about the games at the didTRAD Conference in Barcelona this afternoon, I think now is a good time to write this post, so I can share a few thoughts about why this game was not as effective as it could have been and how I will improve it in the future. For this game, students had to edit and revise a translated Wikipedia article I had selected from a list of articles needing cleanup after French translation. To complete Level 1, students had to identify and correct at least five language errors in the English version, without consulting the source text. Once they had finished, they could then move on to Level 2, where they had to compare the French ST and English TT to identify and correct at least four transfer errors. Level 3 involved identifying at least three violations of Wikipedia’s core content policies, and Level 4 involved identifying and correcting at least four instances where the English translation did not conform to Wikipedia’s Manual of Style. To successfully complete each level, students had to show me the errors they had identified and the corrections they were proposing. I would then award points for each error they had correctly identified and resolved: they earned 1 point per Level 1 error, 2 points for Level 2 errors, etc. Students could win either by completing all four levels in 45 minutes or by accumulating the most points in 45 minutes. This meant we could have multiple winners. So what went wrong? Well, when designing this game, I had assumed students would try to get through the levels as quickly as possible, finding just the minimum number of errors (or perhaps one or two more to earn a few extra points) and then moving on–particularly since I had weighted the points to make Level 4 more lucrative. After all, a student who whipped through all four levels resolving just the minimum number of errors would finish with 38 points, whereas a student who stayed at Level 1 looking for as many errors as possible would have to find and correct 39 problems to beat their classmate. As a player, I would want to head to Level 4 as quickly as possible so I could accumulate points up to four times faster than students in lower levels and be guaranteed to win the game. As it turned out though, some students focused on correcting as many mistakes as possible mistake at each level, and since I had purposely chosen a translation that had a lot of problems (to give students a better chance of finding errors quickly), only 2 of the 10 students who attended class that day were able to win the game. When I surveyed my students about the games after the course had ended, I wasn’t surprised to read a comment that the Wikipedia Level Up game was too complicated to be easily completed in the time allowed. For next year, I will double the time I had allotted for the game (from 45 to 90 minutes) so that students are better able to complete the existing levels. I will also add “Level 5: Enter your corrections into Wikipedia”, so students become more familiar with the platform, and a bonus “Level 6: Decide whether the translated content should be adapted to better target English-speaking readers” to help students develop their subject-matter expertise. Finally, since the most important objective of this game is that students are exposed to as many aspects of Wikipedia translation as possible, I will change the criteria for winning the game so that points are collected only as an extra challenge: students will be trying to set a high score that future students may want to beat, but the points won’t count toward winning the game. Instead, students will win if they successfully complete all five levels within the allotted 90 minutes, and they will earn an additional 50 bonus points if they can complete the bonus round. Next year, after I’ve implemented these changes, I’ll write a follow-up post about whether this game was more successful with my next group of students, and I’ll offer a few thoughts about how the rest of the games fared the second time around. For the past few years, I’ve been making an effort to incorporate games into my translation courses: last term, I asked my Theory of Translation Students to try making their own games, which we played in conjunction with a Reacting-to-the-Past-inspired game related to the drafting of CAN/CGSB-131.10-2008, the Canadian Standard for Translation. So this year, I wanted to see whether I could create games for some of the other classes I teach, and I started off with my introductory translation into English course, where students are expected to acquire translation strategies, increase their knowledge of research tools and learn how to resolve translation problems. With these aims in mind, I created a series of 10 games, and we played a different one almost every week of the course. Most took somewhere between 25 and 45 minutes to complete. Each had different rules and aimed to develop a different combination of translation skills: In some games, students competed in teams, while in others they worked individually; sometimes, students competed against one another, but in other cases, they competed against an external foe (such as a published translation). Some games were designed to develop documentation skills (e.g. learning to use online tools and reference materials), some aimed to help students improve their ability to work under pressure, and quite a few focused on specific translation challenges (e.g. wordplay) or specific types of texts (e.g. comics). After the course was over, I surveyed my students to see what they thought of the games (and the leaderboard where everyone could see their progress). I’ll be talking about the games and the survey results later this month at the CATS conference in Calgary, and then in July at the PACTE conference in Barcelona. I try not to repeat in my blog things that I’ve already said at conferences or in publications, so this post won’t cover the survey results. Instead, I wanted to write two complementary blog posts: one that talks about the game students enjoyed the most, and another that discusses the game they enjoyed the least. Today, I’m starting off with the game most students identified as their favourite. I updated a Google Speadsheet with the points after every round and posted the results to the course website so the teams could see where they stood. At the end of six rounds, the team with the most points was declared the winner. A lot of strategizing took place: one team, for instance, was less interested in being the first to get their translations in because they wanted to have the shortest version and as many hashtags and twitter handles as possible. They ended up accumulating 33 points and winning the game. Why did this game work well? Although the students who responded to the survey didn’t comment on why they liked the game, their comments on how the games could be improved in the future (more on that in my next post) have led me to some of my own conclusions. First, this game took about an hour and a half to play (including the time for establishing groups, going over the rules, etc. ), but each of the tweets we translated presented a different challenge: some were almost 140 characters long and would therefore be harder to keep under the character limit; some had several hashtags or twitter handles that might need to be adapted; some were supposedly being translated by the same person who had posted the original tweet, while others were supposedly being retweeted by another user for a different purpose, etc. This meant that students had to adopt different translation strategies each round. 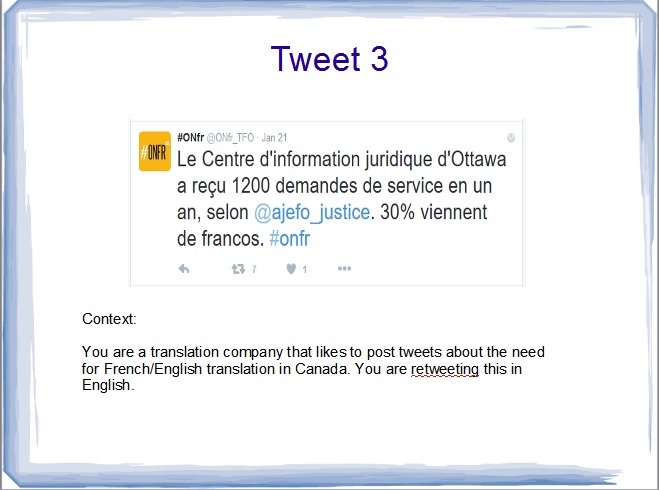 Second, the students had to work under low-stakes pressure: each group was conscious that another group might post their translation first (and therefore win 1 point), but they also wanted to make sure they had a short translation and relevant hashtags, so they were constantly trying to translate quickly and succinctly. The stakes were low, though, because the students’ performance in the games was extremely unlikely to affect their final grade in the course since 90% of the course grade was based on assignments and tests, and the 10% set aside for in-class participation was based largely on attendance and homework rather than performance in the games. Finally, we were able to spend about 15 minutes setting up the game–that is, going over the rules, reviewing the context in which tweets might be translated, and thinking about the constraints Twitter users work with. This helped students feel more comfortable with the game before it started. In my next post, which I hope to be able to write later this month, I’ll talk about one of the less successful games and why it didn’t work as well as this one. As I mentioned in my last blog post, this year, my undergraduate Theory of Translation students wrote 500-word Wikipedia articles on translation-related topics as one of their course assignments. About two thirds of the class opted to cover one of these topics instead of creating a game for us to play, so Wikipedia now has half a dozen new (or significantly expanded) articles profiling Canadian translators, professional translator associations, term bases and more. Be at least 500 words long. Cite at least three different sources, including books, journal articles and news articles. Include features like infoboxes, links to relevant Wikipedia articles, images, and section headings, as appropriate. Not every article that was written made it into Wikipedia, mainly due to the extensions I gave for the assignment: with many students submitting their articles close to the end of the term, I wasn’t able to mark everything until after the semester was over. Next year, I’ll have students submit their first drafts as mid-term assignments, and then have a follow-up assignment requiring students to revise their articles and post them to Wikipedia before the end of the term. This will make sure that the articles are revised and published to Wikipedia within the 12-week time frame of our course. This semester, I’m teaching our newly created, MA-level Research Methods in Translation Studies course (more on that in a future post), so Gabriela Saldanha and Sharon O’Brien’s recent book, Research Methodologies in Translation Studies (St. Jerome, 2013/Routledge, 2014), couldn’t have come at a better time. While I was deciding how to organize the course, I leaned heavily on the structure of the book, which opens with a chapter on principles and definitions, and then delves into product-oriented, process-oriented, participant-oriented, and context-oriented research before ending with a section about how to structure a research paper. With only six chapters (excluding the introduction), it doesn’t align perfectly with a 12-week course, but some of the topics it covers in a single chapter (e.g. product-oriented research) can certainly be split into two or even three class sessions, with students exploring, say, critical discourse analysis one week and corpus linguistics the next. In terms of content, the chapters offer exactly what I was looking for: comprehensive overviews of the research methods at hand, discussions of the strengths and weaknesses of each, and brief reviews of key publications. The section on process-oriented research, for instance, covers introspection, key-stroke logging and eye-tracking methods. The authors explore the advantages and disadvantages of each, consider the various challenges involved in collecting and analyzing data using these methods, and briefly discuss the research questions that have already been tackled by TS scholars. Particularly helpful were the references to the hardware/software most commonly used to do this kind of research (e.g. keystroke logging software Translog, which I was familiar with, and eye-tracker developer Tobii, which I was not). When Magdalena Bartlomiejczyka reviewed Research Methodologies in Translation Studies for the Translator and Interpreter Trainer earlier this year, she noted that the book was probably too advanced for BA- or MA-level researchers. I certainly agree that BA students would likely be intimidated by the breadth of research methods covered here; this semester, for example, many of my undergraduate students felt overwhelmed by the quantity of information in the “Quality of Translation” entry from the Routledge Encyclopedia of Translation Studies, so I imagine that reading through some of the details in this book would have much the same effect on them, given that they haven’t yet been exposed to much translation theory and research. I do, though, think that MA-level students (and PhDs too, of course) would find this book helpful: in general, it is comprehensive without being overwhelming, and for students who are unsure of the kinds of research they would like to do, the book gives them a good idea of the possibilities available to them, as well as the challenges they will likely face when they actually start their projects. I didn’t assign this book as a required textbook in my MA class this year, because instead I wanted my students to read journal articles as examples of research projects that use the methods in question, but as I’ve been preparing lecture and discussion materials, there is little I’ve needed to simplify for my students, and much that I might have otherwise overlooked. The book is not primarily intended as a textbook for teaching research methods (or at least the authors do not specifically mention instructors when describing the intended audience), so it does not include related pedagogical exercises for the classroom. I’d have liked these, even if the exercises were offered only in a companion website rather than the book itself. Nonetheless, exercises are easy enough to develop based on the existing content: Saldanha and Brien offer, for instance, many examples of the challenges researchers will face when planning and conducting various kinds of research projects. Instructors can easily look to these examples when designing related problem-solving activities. (E.g. Having students work in groups to brainstorm responses to questions like: “What tools would help you effectively study the working process of translators in a busy, open-plan office?” or “How would you design a corpus to ensure it is representative of a wide range of literary translations?”). In short, I think both instructors and researchers (whether they are novices looking for an overview of existing research methods or more experienced researchers looking to adopt a new methodology) will find the book a helpful introduction to the kinds of Translation Studies research that can be done, the challenges researchers will face when planning and conducting this research, and the ways these challenges can be addressed. My summer project this year involves Wikipedia again. I’ve already studied the motivations and profiles of Wikipedia translators as well as revision trends in translated Wikipedia articles, so I’m now moving on to tracking translation flows in English Wikipedia. The things I’ll be looking at include how the demand for translation from any of the 290 Wikipedia languages into English has changed over time, how this demand matches up with Wikipedia activity in those languages, how often translations from a given language are flagged for revision, how these revision requests change over time, how often translated articles in need of revision are deleted and why, and whether the change in the number of active users mirrors the changes in translation activity over time. Are these questions important? I would argue that they’re worth studying for various reasons, but mainly because the discourse about crowdsourcing often emphasizes that the diverse backgrounds of the volunteers who participate in crowdsourced translation initiatives means that translations from and into “exotic” languages can take place and may even be more frequent than in traditional translation projects, where the cost of localizing a website into a language with just a few thousand speakers would be prohibitive (see this interview with Twitter’ Engineering manager Gaku Ueda, for instance). So it’s worth asking questions like whether some languages are prioritized over others and whether some have more activity than others. The answer is likely “yes” in both cases, but if we look at which languages are receiving the most attention, we might be surprised by the results. After all, the five largest Wikipedias, based on the number of articles available in each version, are currently English, Swedish, German, Dutch and French, in that order, but just one year ago, Swedish was ranked 8th. Swedish Wikipedia is not, of course, comprised solely of articles translated from other languages, but the fact that it currently has more articles (and far fewer native speakers) than say German or French led me to wonder whether more translations are flowing into and out languages like Swedish, which are typically less well represented online than languages like English, Chinese and Spanish. I’m not very far into this project yet, so I don’t have much data to share, but here’s a graph of the demand for translation from French into English, Spanish into English and German into English. I compiled the data using the current Category:Articles needing translation from French [or Spanish or German] Wikipedia page and comparing it with previous versions approximately every six months for the last six years, based on data from in the Internet Archive’s Wayback Machine. (The gap in both the Spanish and German versions exists because the Wayback Machine did not crawl these two pages in 2010). Number of pages listed in the Category:Articles needing translation from [French, Spanish or German] Wikipedia pages, 2009-2015. 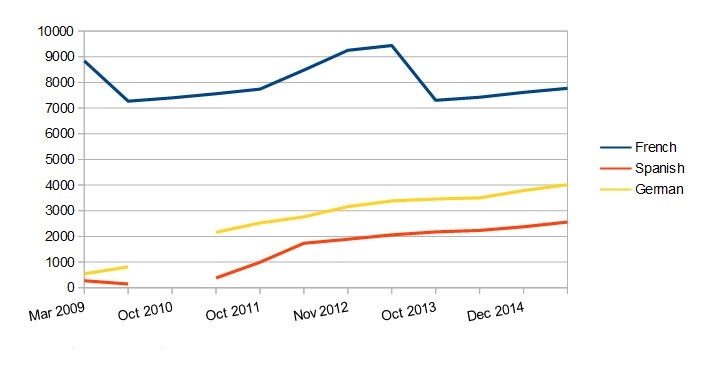 As the graph shows, requests for translation into English from French, Spanish or German have increased substantially over the past six years. From what I’ve seen so far, French seems to be an anomaly, because the number of articles listed as being good candidates for translation varied widely, sometimes increasing or decreasing by 1000 in just six months. These numbers don’t tell us much yet, but I’ll be digging into them more over the summer: I want to see, for instance, how long it takes for an article to be removed from the list and whether demand for translation from English into these languages is similar. This could help explain whether the number of articles listed as needing translation is increasing because little translating is taking place and a backlog of translations is accumulating, whether it is increasing because Wikipedians are becoming more interested in translation and are therefore adding articles to the lists more frequently now than in the past, whether articles are being translated and are simply not being removed from the list, causing demand for translation to appear inflated, etc. I hope to have more to share soon. In the meantime, I’d certainly welcome any comments on the project, or thoughts on translation in Wikipedia! “I realize now why professors say ‘don’t use Wikipedia'”, one of my students remarked during a group presentation about the challenges of translating a Wikipedia article from French into English. Once again, I had assigned Wikipedia articles as a final translation assignment for the 22 students enrolled in Introduction to Translation into English this past winter. This student’s remark came about after the group became frustrated with the French article’s lack of sources and occasionally promotional tone. In their final translation, they took a 2800-word text about French-Canadian singer-songwriter Pierre Lapointe with 21 references and turned it into an 1600-word article with 47 documented sources and a more neutral tone. Another group’s article on reasonable accommodation went from 14 references in the source text to 66 in the English translation. En février 2005, deux ambulanciers ont été expulsés d’une cafétéria de l’Hôpital général juif de Montréal parce qu’ils mangeaient un repas qu’ils s’étaient préparé. Le 24 février 2007, à Laval, une jeune musulmane ontarienne de 11 ans est expulsée d’un match de soccer auquel elle participe et qui réunit de jeunes joueuses canadiennes. In this case, they settled for “ejected” in the first example and “sent off” in the second, after consulting various English media reports. A graduate assistant helped me correct these assignments, and since we both recommended different translations, I’d certainly agree with my students that this was a tricky case. In the end, I suggested “asked to leave” for the first example, because it seemed to depict the event in the most neutral way, which is one of Wikipedia’s core content policies. Most groups took various liberties with their source material, rewriting and reorganizing the article to present information more effectively, remove details that couldn’t be verified, and update details that were several years old. In almost every case, these decisions made the final English articles much better quality than the original French articles, and it helped students look more critically at their source material (as the comment from the student I cited earlier suggests). I’ve just returned from Monterey, Califonia, where I was at the Education Translators, Interpreters and Localizers in an Evolving World conference at the Middlebury Institute of International Studies at Monterey. As the title suggests, the talks focused on translation and interpreting pedagogy, and I came away with some new ideas after a number of very interesting presentations. Most of the day consisted of parallel sessions, so obviously I wasn’t able to attend everything. I’ll just summarize a few of the talks I particularly enjoyed. I’ve grouped them into three broad categories: those that discussed how to design new course offerings or fundamentally reshape the way a course is offered, those that touched on online teaching, and those that offered ideas or activities that could be integrated into existing translation courses. On Saturday morning, I listened to Kayoko Takeda from Rikkyo University in Japan speak about developing a general education course on “Translation and interpretation literacy” for undergraduate students at her university. It focused on topics like the roles translators and interpreters play in society and professional issues translators and interpreters face without actually having students practice translation. What I found most intriguing was the way the course was designed: three instructors co-taught the course, and 14 guest speakers came to the Saturday-morning class to speak about topics like crowdsourcing and machine translation, business practices, subtitling, Bible translation, and community translation. These guest speakers would give students tasks to do before their talks (e.g. consulting a website, reading blog posts or articles), and then students would participate in the lectures, often by producing in-class essays on topics like rules, remuneration and rewards, or technology. Suzanne Zeng talked about the University of Hawaii’s Interactive Video Service (HITS), which allows her to teach up to three groups of students simultaneously via an interactive closed-circuit TV system. While Suzanne teaches a group of students in one room, other groups of students at university campuses located on various Hawaiian islands sit in similar classrooms and participate in the class via video. All students have microphones at their desks, and when they push the button to talk, the video cameras are programmed to zoom in on the speakers so everyone else can hear what their peers have to say and see them clearly while they say it. The shared screens also allow everyone to see any PowerPoint presentations the instructor might use, and any notes he or she might write on the white board. I liked the way this system works because instructors can teach both in person and online at the same time. Having all students together simultaneously allows everyone to participate in discussions and group exercises, regardless of which island they might live on. Suzanne did mention that she has to monitor the video feeds while she is teaching so she can make sure the students in the other locations are fully engaged: addressing them directly helps remind these students that she is able to see them and is paying attention to them as well as the students in her classroom. She also noted that the system doesn’t allow for any flexibility in timing: class has to begin and end at a precise time because that’s when the video feed stops and starts; so if she is in the middle of a sentence with just a few seconds left on the counter, she’ll be cut off as soon as the clock reaches zero, and students in the remote locations won’t hear the end of what she had to say. That means instructors need to be very conscious of the clock with a system like this. Qjinti Oblitas and Andrew Clifford, from my department at York University, offered some insight into how their interpretation students develop close ties with their peers, even though the first year of our Master’s in Conference Interpreting program is offered online. Through a variety of sometimes humourous examples, Qjinti and Andrew showed that students engaged with one another outside of the virtual classroom via private Facebook groups, text messages, Skype chats, and apps like WeChat, and they argued that the students felt a real sense of community with their peers—so much so in fact that many of the students found ways to meet one another in person if they lived in the same country or were travelling to a place near one of their classmates. Finally, Cristina Silva said that every strategy for offline teaching could be adapted for the online classroom. She offered a variety of examples, some of which I use already, and others that I will consider using in the future—though I should point out that many of these ideas would work just as easily in a face-to-face classroom. Cristina’s suggestions included having students translate together via Google Docs, having students practice editing machine translations while using screen-sharing software so that their classmates can see their results, and encouraging students to use Dragon Naturally Speaking to record themselves while they dictated a sight translation to see whether their productivity increased compared to just typing out the translations themselves. Kent State University’s Erik Angelone offered a new way of having students assess their translation process. Arguing that other process-focused research methods like think-aloud-protocols and keystroke logging were too time consuming or too complicated to integrate into the classroom, Erik proposed using screen recorders like Blueberry Flashback Express to have students record their computer screens while they worked. Then, when students look back at these recordings, they would be able to see, for instance, whether they hesitated before translating a word but did not consult an electronic resource, which might indicate that the translation needs to be double-checked. Integrating screen recordings into the classroom would also allow students to learn from the methods other students or even professional translators had used: how do others deal with distractions like email alerts, for instance? Or how did others research a problematic word or phrase? I thought this was a very helpful idea for getting students to think about how they translate and whether their method could be more effective. One audience member did mention that the disadvantage of screen recordings is that it doesn’t show what students are doing off their computers (e.g. Consulting a paper dictionary), but Erik suggested that students could comment on their screen recordings afterwards in a retrospective interview. Of course, they could comment more informally as well, by adding a few written remarks at the end of their recording to describe any of their research techniques that wouldn’t show up in the screen recording. I’m going to integrate an activity like this into my introductory translation class next term, and after I do, I’ll write a short post about the results. There were other talks I enjoyed as well, but this post is getting quite long. I think I’ll end with a link to the tweets that came out of the conference, which, though short, give a good overview of a larger selection of talks. You can take a look at the tweet compilation on Storify here. Until I started this post, I didn’t realize it’s been three months since I’ve blogged. This was partly due to a hectic fall term, so I’m taking advantage of a few relatively quiet weeks to finally write something new. I was inspired, actually, by the fact that I’m doing something different this term: for the first time in three or four years, I took on a course I’ve never taught before. In fact, I’m co-teaching a course we’ve never offered before in our program: Project Management. Since I spent a few weeks in late December working out the syllabus with my co-instructor, I thought I’d write a brief post about some of our plans for the course. Incidentally, for anyone who might be teaching (or preparing to teach) a course with a project management component, Circuit, the magazine published four times a year by the Ordre des traducteurs, terminologues et interprètes agréés du Québec, recently released an issue focusing on project management. Debbie Folaron’s article on what to include in a PM course is very helpful, while many of the others (like this one describing a freelancer’s first experience as a project manager) can serve as case studies in the classroom. The bulk of the coursework we eventually settled on revolves around two main activities: a group translation project, and a group corporate website. On the first day of class, students formed their groups, which they’ll be working with for the rest of the term. To help them choose their team-mates, I adapted an activity I first heard about from Egan Valentine, who teaches at the Université du Québec à Trois-Rivières. On the train back from a conference at the Universitat Autònoma de Barcelona last summer, Egan told me about his online class, where students formed groups early in the term by posting profiles of themselves on the discussion forum in much the same way that translators typically do on websites like Translatorscafe.com. So for our class, we spent some time looking at job ads for translators and project managers and brainstorming about the skills these jobs require. Students then had a few minutes to prepare a brief profile of themselves that we could tape onto the classroom walls (don’t worry–I brought in low-tack tape so we wouldn’t ruin the paint), and then they could walk around and browse the profiles to help them choose team members for their mock translation company. Once they finished, each group chose a name for themselves. Now, the students spend anywhere from a quarter to half the class each week collaborating on activities that range from preparing a quote for a large translation project to working out a revision and review process for their group to follow. In addition, over the course of the semester, students will have time in class to prepare a functional but fictitious website on wordpress.com. Last week, they worked on their About pages, where they discussed their company’s strengths and posted a profile of each team member. In three weeks, after we’ve had a chance to discuss issues like international standards, they’ll prepare a statement about their quality control process. Two weeks after that they’ll add a blog post describing how they’ve handled their translation project, and at the end of the term, they’ll prepare a FAQ page where they can respond to questions a client might ask a translation company, such as who owns the content of translation memories and whether crowdsourcing is a viable solution for a large, multilingual translation project. I’m hoping that these exercises will help them consider the issues faced by project managers while also making them more familiar with a platform like WordPress in case they need to create their own websites when they enter the professional world. I’ll write another post about the course once it’s finished and I’ve had the chance to reflect on what worked well and what needs improvement. If anyone else has taught a project management course, I’d love to hear about how you run the class.